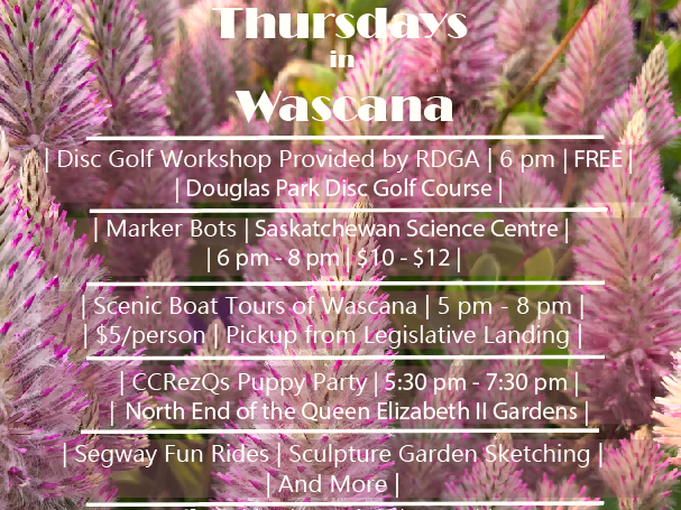 Every Thursday during the summer, there were events in Wascana Centre. We had a great line up including: yoga, escape manor cages, tai chi, sk sports hall of fame pop-up, local barre, Segway tours, paddle events, boat tours, lumberjax axe throwing and many many more! The RDGA invites you out to learn how to play the up and coming sport of disc golf! It’s like the golf but with discs instead of balls and clubs. For 2 days this summer we are offering a FREE tutorial to anyone interested, all you have to do is show up ready to learn. Starts at 6pm. At the north end of the Queen Elizabeth II Gardens, cuddle and play with puppies while talking to staff about fostering and adoption opportunities! 5:30 p.m. to 7:30 pm. Donations welcome. 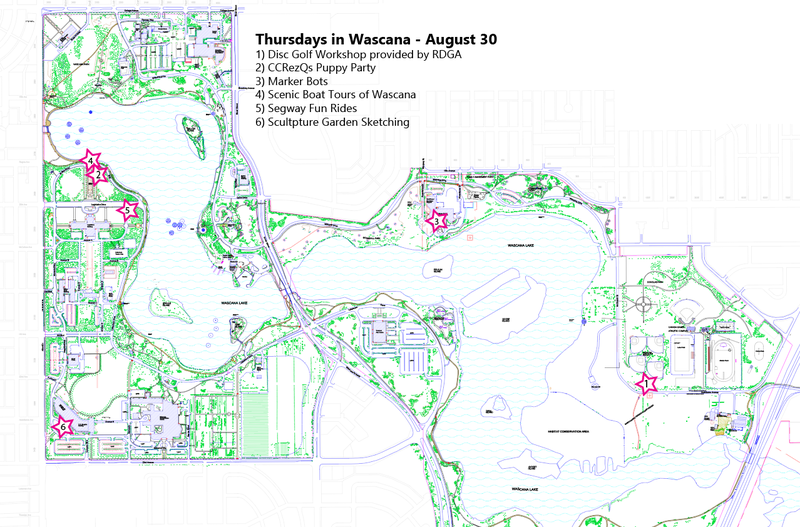 Enjoy a beautiful scenic tour of Wascana from the water for $5/person, from 5:00 p.m. to 7:30 p.m. Pickup is from Legislative Landing every 1/ hour. These tours will run every Thursday evening this summer. They scribble! They battle! They dance! Your imagination is the limit when it comes to these robots. Make them out of everyday materials in the Markerspace and watch them mark art, battle other robots, or even just dance on the tables. 6:00 p.m. to 8:00 p.m. at the Saskatchewan Science Centre. From 5:30 p.m. to 8:30 p.m. try out the Segway/Ninebots around a mini-circuit course for a special rate of $10 for 10 minutes. Safety equipment and lesson provided. No balance, coordination, or experience necessary. Meet at the corner of Legislative Drive and Avenue A. Go to the MacKenzie Art Gallery to join in some sculpture sketching. Class goes from 7:00 p.m. to 9:00 p.m.